Below are the annual awarded scholarships and last year’s recipients. 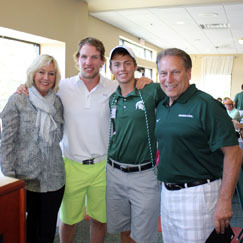 We are pleased to announce that with the success of our golf outings, we have recently established a new athletic scholarship through the Spartan Fund at MSU. 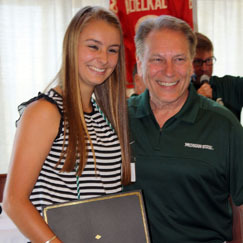 Anika Sasinski, daughter of Ewa and Jan, graduated from Reeths Puffer High School, where she served as both Student Council and Class President. She played four years on the varsity tennis team, and was voted Team Captain and Most Valuable Player. 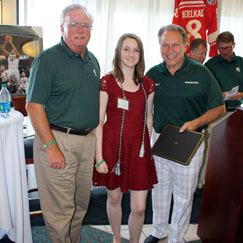 Anika plans to major in Biomedical Engineering and hopes to participate in MSU’s Study Abroad program. 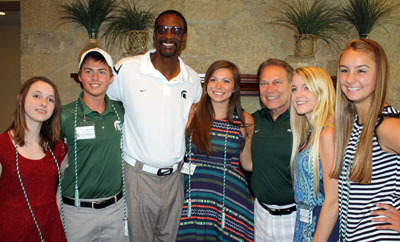 Sam Kling, son of Terrence and Sue, graduated from Mona Shores High School, where his high achievement on Advanced Placement coursework will allow him to enter MSU with sophomore status. He played four years on the varisty tennis team, during which he earned awards as MVP and All-Conference boys’ singles player. He hopes to be a walk-on player for the Spartan tennis team. Sam plans to dual major in Computer Science and Geography. Danielle Schugars, daughter of Kimberly and Scott, graduated first in her class from Reeths Puffer High School. 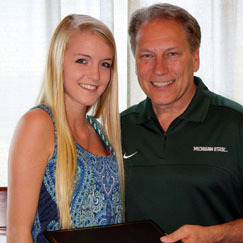 She is admitted as an honors student at MSU, where she plans to study Computer Science. In addition, she was chosen to participate in the Professional Assistantship program, which will allow her to work on graduate level research while still an undergrad. Claire DeYoung, daughter of Roger and Leslie, graduated from Mona Shores High School, where she took a heavy load of honors and Advanced Placement science classes. She was a four year member of both the volleyball and tennis teams. Following in the footsteps of her mother, Claire plans to major in nursing and hopes to work in the neonatal field. This is the first year the Club has awarded the Gene Kendra Book Award, named in honor of the longtime Club member Gene Kendra, who passed away earlier this year. 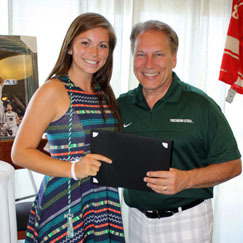 Jessica Firestone, daughter of Wayne and Lynda, graduated from Mona Shores High School, where she pushed herself by taking Advanced Placement Calculus, Chemistry, and Statistics. In addition to playing three years of varsity volleyball, Jessica captained an AAU club volleyball team that made it to the national finals. She plans to obtain her undergraduate degree in Kinesiology, before moving on to get a graduate degree to become a Physician Assistant. We congratulate these students in their pursuit of excellence in education!